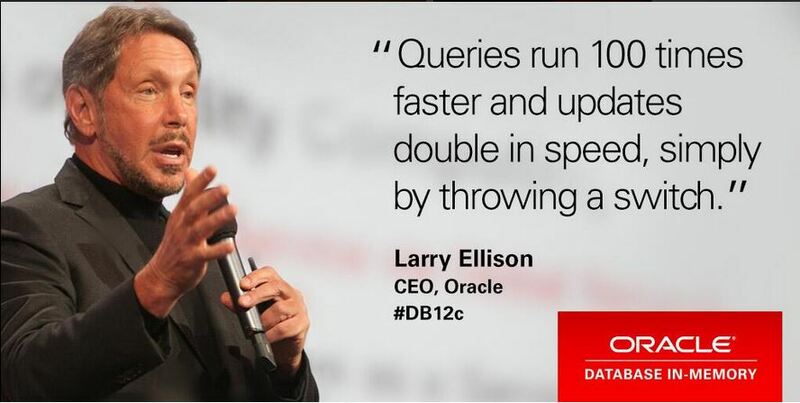 On June 10 2014 Larry Ellison CEO of Oracle Announced the the new 12c “in-memory” feature. The 12c feature will be available for the public in July 2014. 12c In-Memory can be installed and will be transparent to application (no changes required). One of the primary goals for Oracle with in-memory database is to increase the performance for both Queries and Transactions. Both Row and Column formats are used in 12c Database (Column is for Analytics). Indexes being removed will speed up OLTP while using mixed column formats in 12c in-memory. In-memory option can be used in EXADATA with Real-Application Clusters (multiple nodes). Only “Active data” are being resided in memory (hosted on Flash or DRAM) and cold data will be residing on Disk. This approach is better in efficiency and economic (since most data will be residing on low cost disks). High Availability:Backup/Recoverability/Manageability remains the same no changes is required. * Duplicate in-memory columns on another node, this will lead to downtime elimination bys using the other duplicate after failure.